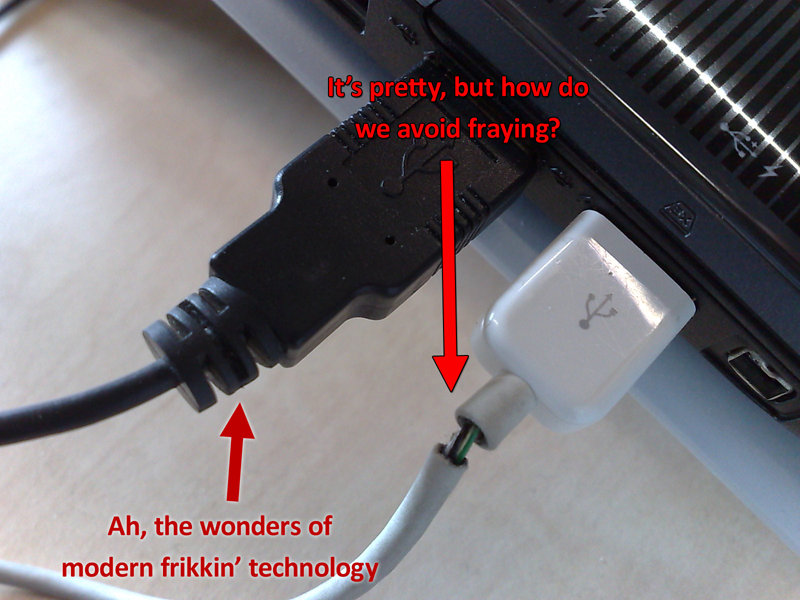 While people talk about Nokia having lost its charm as a Mobile device manufacturer and that it can no longer manufacture good handsets for its users, here are some metrics to prove them all wrong. Users have started getting Android phones, iPhones and also when we see our friends – many of them have Android handsets, add Nokia’s low value acquisitions to it – all this would mean that Nokia has lost its market share substantially and not even the top favorites of user but this is not totally true. 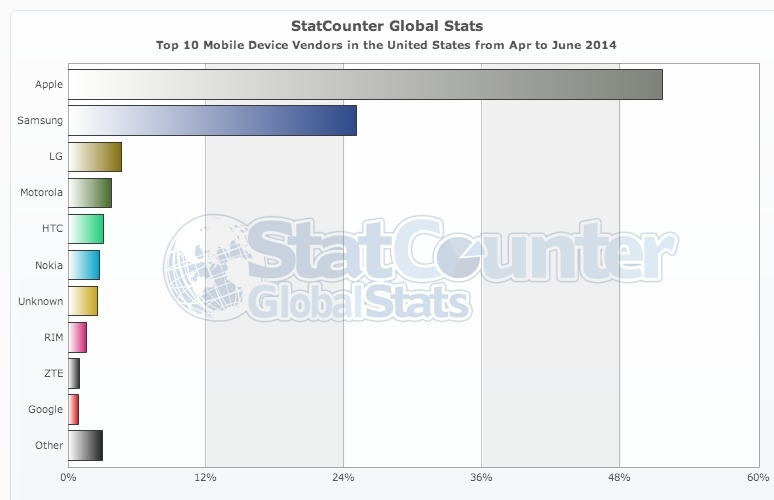 We generated this metric (using statcounter) which shows the market share of Nokia among all the mobile phone device manufacturers worldwide (shown below). You can see clearly that Nokia ranks 3rd after Samsung and Apple with an overall market share of Mobile device manufacturers owning 14.43% share of the total pie. The next metric which we took a look at was that of Nokia’s market share in Various continents and we found that the only continent where Nokia lead the market was Africa (with over 32%) where it left companies like Samsung, RIM (blackberry) and Apple way behind. 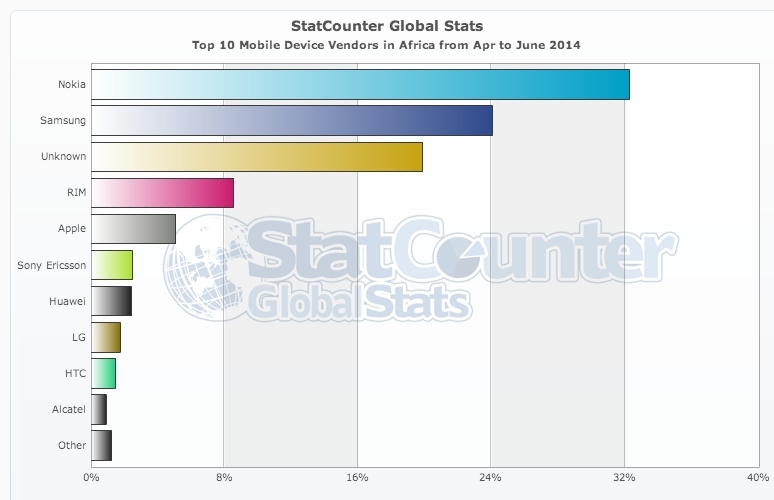 However, Nokia does lag behind other Mobile device manufacturers in all the other continents. Here is another chart that compares those numbers. 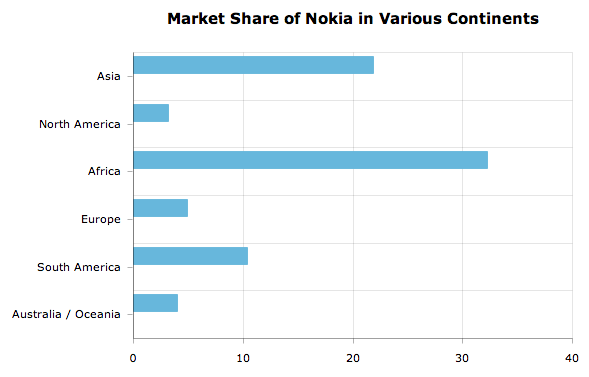 You can clearly see that Africa and Asia are the only two continents where Nokia has a respectable market share. Next, we also took a look at Nokia’s market share among mobile device manufacturers in five of the worlds largest mobile telecom markets (countries) – USA, India, Brazil, Russia and China. 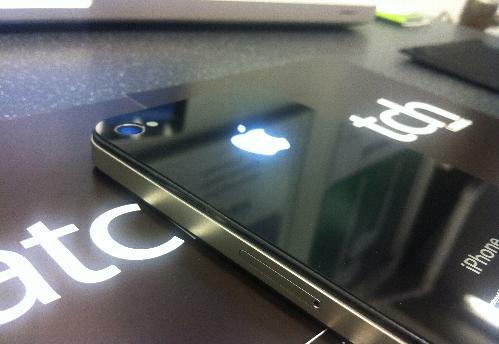 The first country we took a look at was USA and we all know that the top mobile device manufacturer in this country is Apple followed by Samsung. Nokia ranks 6th in the US with 2.72% which is not actually bad considering HTC and Motorola which which have 3.05% and 3.74% market share respectively. 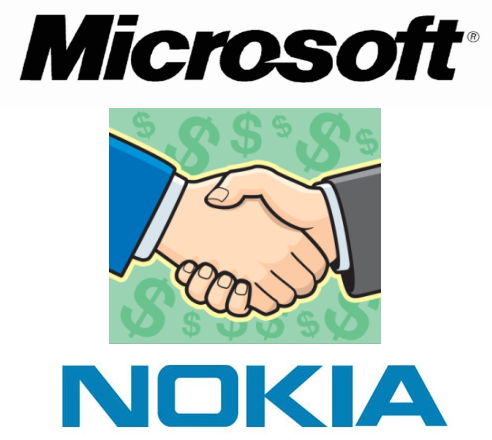 Next is China and as expected Nokia lost it big time to other brands in China with the market share being a mere 1.93%. However this was exactly the opposite in India which happens to be one of the largest mobile markets and China’s close neighbor. 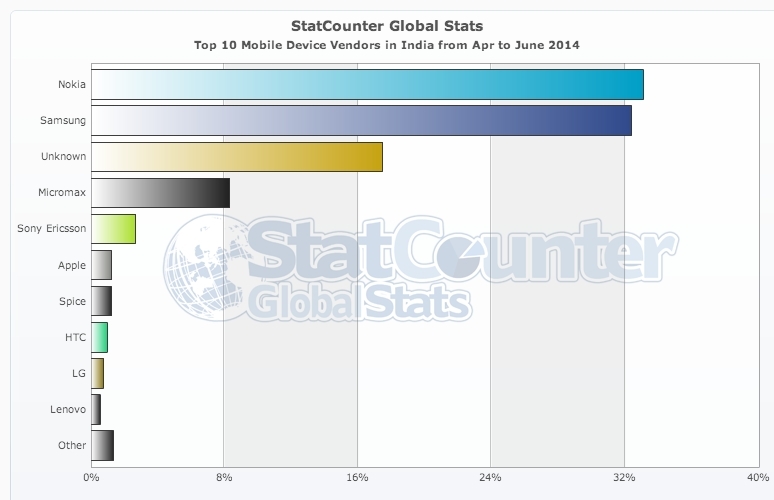 In India, Nokia holds a market share of a solid 33.08% in India. 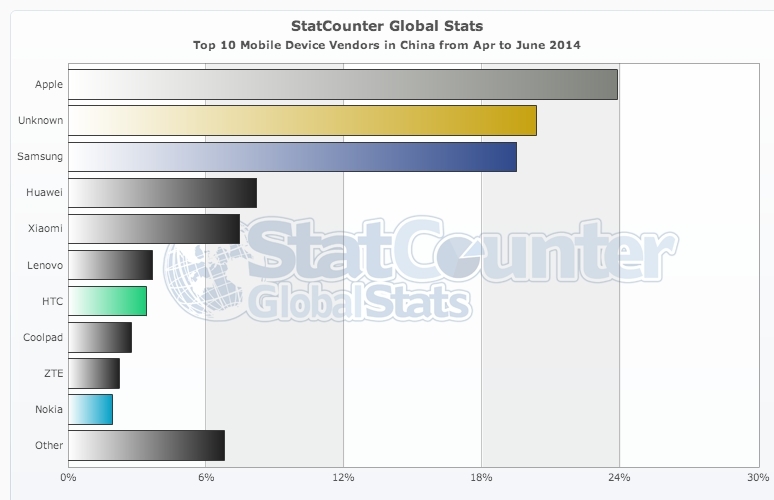 In Russia, Nokia takes the 4th spot among other mobile device manufacturers with 8.74% of the market share. 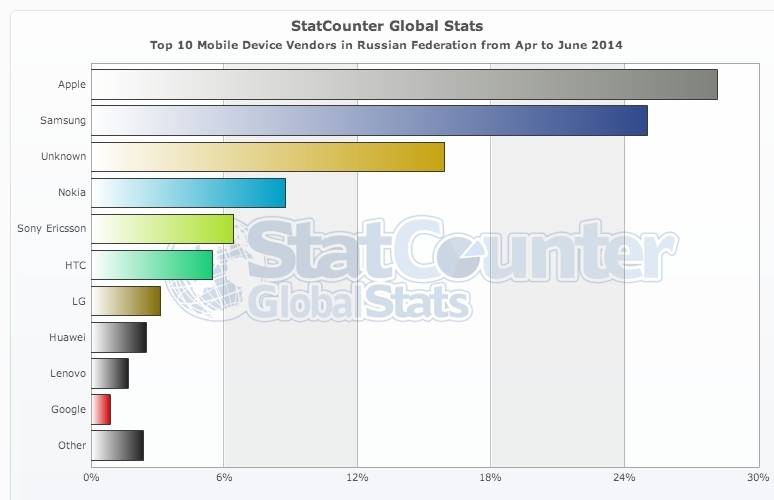 Apple and Samsung lead the pack in Russia as well like many other countries. The last country which we looked at is Brazil which happens to be the 4th largest country in the world by means of total number of mobile phones sold in the country. 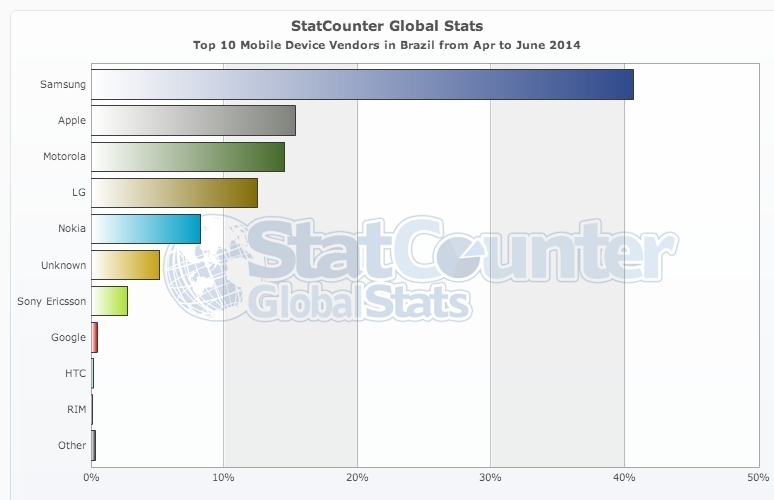 In Brazil, Nokia accounts for 9% of the total mobile devices that have been sold taking up the 5th spot among all other mobile device manufacturers in the country. 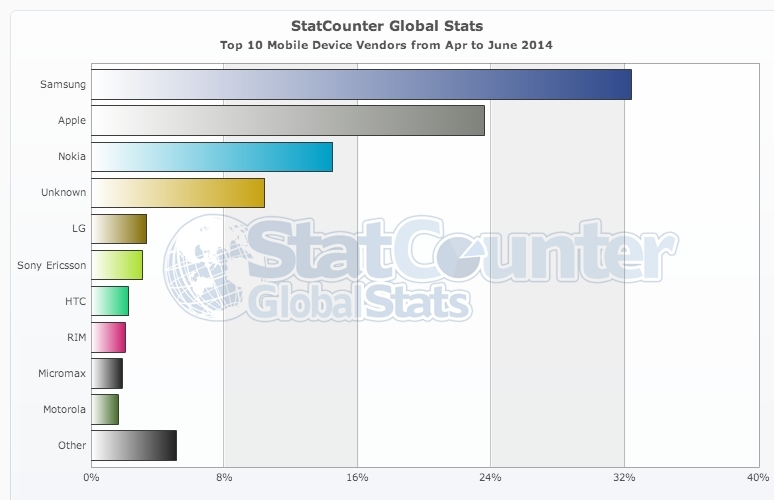 These stats are obviously good for a company like Microsoft which currently owns Nokia. 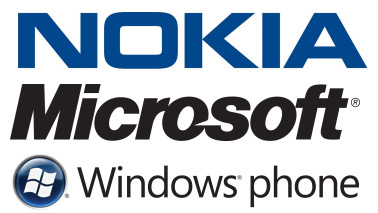 So when Nokia does good in the mobile market, its Microsoft which actually wins the laurels!